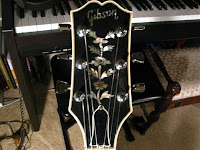 Here's an early version of a Gibson Howard Roberts guitar on eBay, formerly owned by Steve Miller of Abracadabra and Fly Like An Eagle fame. Howard Roberts wanted an instrument he could really hear acoustically when he designed his namesake instrument, and decided on the oval soundhole instead of traditional f-holes. In fact, the first batch of Howard Roberts guitars made by Epiphone, Gibson's sister company, were very acoustic in nature, featuring both the oval soundhole and a carved solid spruce top. According to Howard Roberts himself, these Epiphone models were "a little too expensive and a little too fragile." The subsequent versions by Gibson, like this Steve Miller-owned piece, had bodies made entirely out of maple. 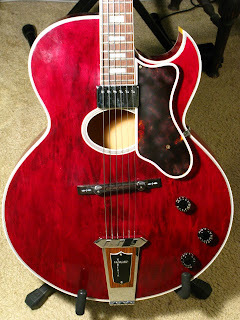 In addition to the standard volume and tone controls, a mid-range roll-off control was also standard on the Gibson Howard Roberts, but many players didn't find it useful and ended up disconnecting it from the circuit. 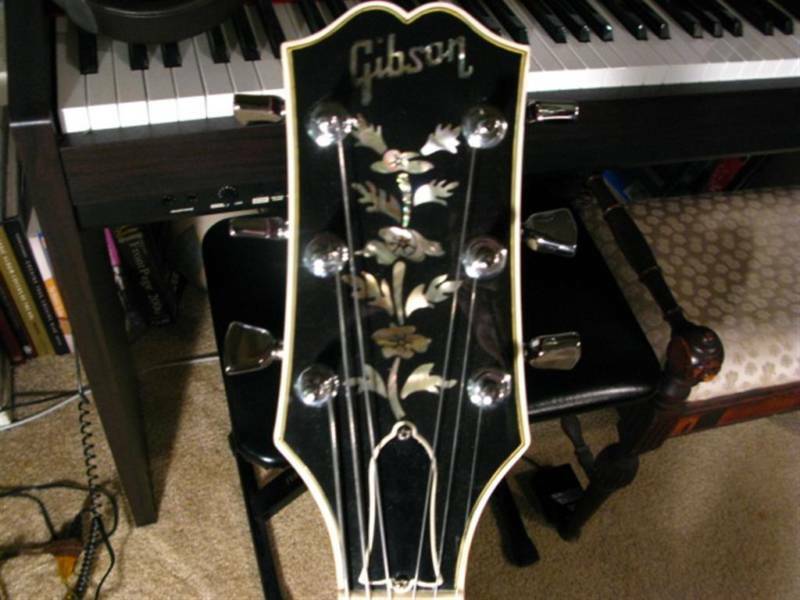 I thought it was pretty cool that Gibson decided to retain the elaborate Epiphone-style pearl inlay on the Gibson Howard Roberts headstocks -- there's some fine, old-world craftsmanship for you! This guitar comes with documentation from Guitar Showcase in San Jose stating it was consigned from Steve Miller's collection as well as a purchase receipt from the Gibson factory indicating that it was made for Miller.